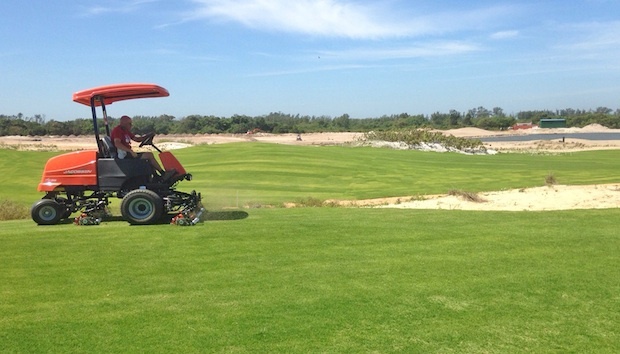 Jacobsen mowing equipment, built at the company’s manufacturing facilities in Ipswich, UK and Charlotte, USA are maintaining the Rio Olympic Golf Course as golf returns to the Olympic Games after a 112-year absence. 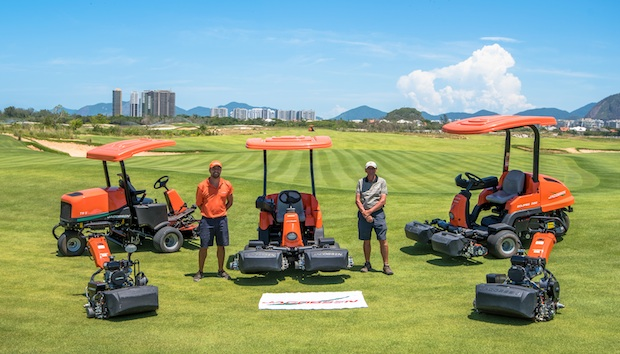 After winning the exclusive supply contract for the mowing equipment, Jacobsen machines have been mowing the course for the past 15 months as construction finished and grow-in progressed. Initially, 18 machines were delivered in June 2014 and included three Eclipse2 walking greens mowers, two Eclipse 322 hybrid powered ride-on greens mowers, four Greens King walking mowers, one SLF1880 super light fairway mower, two LF3800 fairway mowers, three Turfcat out-front ride-on rotary mowers, two UK-built TR3 reel mowers for tees and surrounds and a GA30 pedestrian aerator. By the time the first test event takes place early in 2016, a total of 35 Jacobsen turf maintenance machines will be employed at the course. During the Olympics, the course will be in constant use for 14 days and a team of Jacobsen technicians will be running the maintenance facility to provide 24-hour support. Englishman Neil Cleverly was appointed course superintendent in June 2013 and has worked closely with Gil Hanse, the course architect, whose design was chosen as the preferred option from eight high profile entries. Hanse was voted ‘Architect of the Year’ by Golf Magazine in 2009, the same year that one of his designs, Castle Stuart in Scotland, was considered to be ‘The Best New International Course’. The mix of grass species is an interesting one with Zeon Zoysia used extensively on tees, surrounds, fairways and roughs, while SeaDwarf Seaside Paspalum is used on the greens. Both species are drought tolerant and the Paspalum is also saltwater tolerant, which is important as the quality of the irrigation water will be variable. “We are, once again, delighted to be involved in the Olympic Games and it continues a tradition that goes back over many decades. This was a particularly important win for us, as it marks the return of golf as an Olympic sport after more than a century, and it is sure to be one of the high-profile events at the Games. 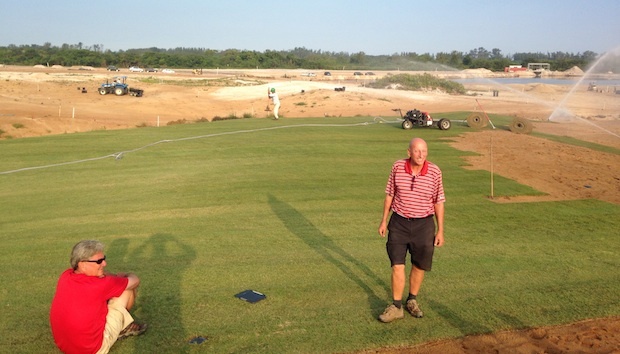 The course, which features natural vegetation, extensive bunkers, a lagoon and sandy rough ground lining the fairways, is now completely grassed and well on schedule for the first test event. During the Games, it will host two 60-competitor tournaments with the women’s event following the men’s competition over a two-week period. It will accommodate 2,500 spectators in grandstands with space for a further 17,500 around the course.